Mr. Scherr began his Kokondo training in the art of Jukido Jujitsu in October of 2003 under the instruction of Sensei Rego. Mr. Scherr began his training as a member of a special program within the Jukido Academy created specifically for home schooled students. 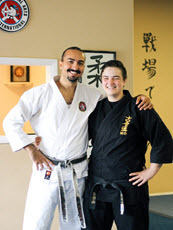 Since that time Mr. Scherr has been a key member of both the dojo’s youth and adult programs as a student and assistant instructor. In addition to regular training at the home dojo in Palm Coast in the arts of Jukido Jujitsu and Kokondo Karate, Mr. Scherr is also a regular attendee of the annual National Seminar of the International Kokondo Association, as well as the annual Florida Jujutsu and Karate Seminar led previously by the late Shihan Paul Arel (founder), Master Gregory Howard, and other leading masters. In July 2007, Mr. Scherr (along with Mr. Alex Greutman and Mr. Vadim Belinskiy), was promoted to the rank of probationary shodan (1st degree black belt) in the art of Jukido Jujitsu at the largest Kokondo function of the year – the International Kokondo Martial Arts seminar. Mr. Scherr and his peers were only the 2nd group of Jukido Academy members to be promoted to the rank of black belt. Mr. Scherr’s testing for black belt began in December 2006 at the 3rd annual Florida Kokondo Jiu-Jitsu and Karate Seminar in Palm Coast; under the eyes of Rego Sensei, Betancourt Sensei, Robert Sensei, Howard Sensei, and the style’s founder, Shihan Paul Arel. During the 1st half of 2007, Mr. Scherr was tested directly by Rego Sensei on five separate occasions – all tests focusing on various areas of self-defense at length. Finally, after over 7 months of black belt evaluations, Mr. Scherr had his final test in July 2007 at the International Kokondo Martial Arts Seminar. At the end of the first evening session, Mr. Scherr was promoted by George Rego Sensei and Shihan Paul Arel to the rank of black belt. In July 2013 he successfully tested and promoted to nidan (2nd degree black belt). Around the dojo Mr. Scherr is known for his absolute excitement for all things martial arts related. Additionally, he is known for ‘throwing’ himself into all areas of training – whether it is self-defense, kata, or assisting students on their own path as a martial artist. His intelligence and joyful nature are among the qualities he best known for.